This salad is from the Iguana Lodge in Osa Peninsula, Costa Rica where John and I have previously offered retreats. They have amazing, fresh, easy meals- just our style! This Mango Salad is an easy one. 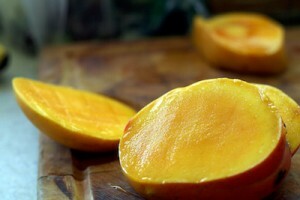 If you are in the north part of the northern hemisphere, mangos may be hard to come by! You can substitute grapes, yellow pepper and avocado for the mango or add to the salad below! I added a handful of arugula and avocado just before serving and it was delicious! Cube the mango. Peel, seed and cube the cucumbers. Mix all ingredients above together and chill.